“I like the “owner” role” stated Laking. “I’ve been a driver for 29 years so it’s fun to change it up a little, especially with a fun and down to earth guy like Ken.” – continued Laking about the transition from driver to car owner. Flamboro Speedway, located in Millgrove, Ontario just a few minutes North West of Hamilton, Ontario, is a tricky single lane 1/3-mile track. It has played host to many exiting APC Series events with JR Fitzpatrick claiming victory there earlier this season. Race fans and media dubbed the 2017 running of the LRR 100 as one of the most exciting events of the 2017 season as LRR driver Andy Kamrath held off series champion Brandon Watson for tough and grueling 100 laps. This event will be Schrader’s second overall event with the APC Series and 3rd race after last season’s double header. Schrader enjoyed mixed success his first time around placing 8th in the first event and a DNF in the second after getting caught up in a front stretch incident. Schrader was asked if having experience around this group of drivers will translate to success. 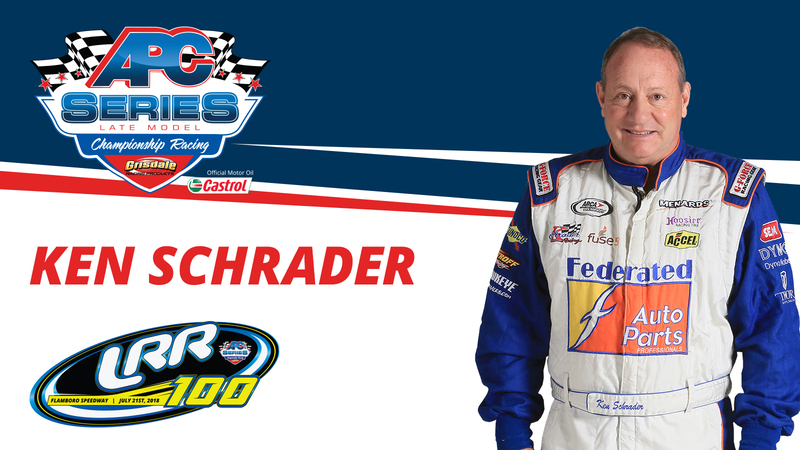 The APC Series in partnership with Flamboro Speedway is thrilled to make this announcement and we look forward to having Ken Schrader in the field Saturday, July 21st for the London Recreational Racing 100.